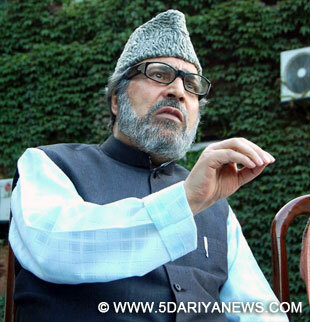 The senior PDP leader and Member Parliament Muzaffar Hussain Baig who attended the all party meeting under the chairmanship of Prime Minister Narendra Modi on Friday has advised the government of India to immediately stop use of pellet guns in crowd control policing and strengthen article 370 and the JK constitution to strengthen the integration of Jammu & Kashmir with India.Talking to KNS over phone from Delhi Muzaffar Baig said “ I told the Prime Minister in the all party meeting that stopping pellets guns immediately is must for restoring calm in Kashmir and protection and preservation of article 370 and the state constitution is the only guarantee for the integration of Jammu & Kashmir with India”. Elaborating Baig said that he reminded the Prime Minister of his five point formula presented by him at BJP’s National Executive meet at Allahabad recently. Baig said he told the prime Minister the five point formula comprising balance, patience, positive approach, empathy and dialogue can provide the guideline for restoration of peace in Kashmir and resolution of long pending Kashmir issue.